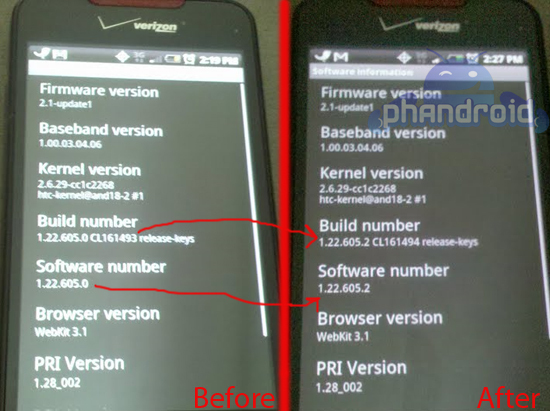 The guys over at Phandroid caught a before and after photo showing a Droid Incredible with different software and build numbers meaning it received some sort of OTA update. (No not Android 2.2.) There have been rumors of continuous reboots and whacky notification bars; could this be a fix? I can say that my Incredible is still showing build 1.22.605.0 meaning I have not received an update or seen an update screen. I also have not had one problem with the device. Interesting stuff for sure. To see, go into: Menu>About Phone>Software Information.